Hey Out of Milkers! We have added better support for the newer iPhones and optimized our app for the latest iOS 12. As always, we love getting your feedback, so write to us at support@outofmilk.com anytime you want. Love this cleanly designed and easy-to-use grocery list that I can add items to whenever I happen to remember them. After using this app for years, I was getting very frustrated with some category issues mentioned by other reviewers. 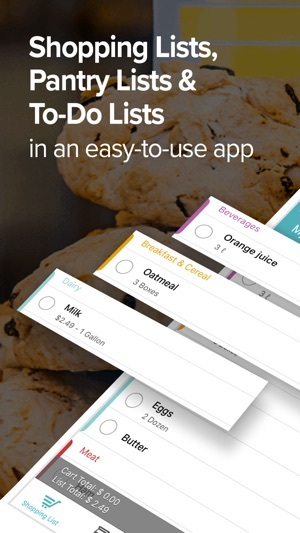 I started looking for other solutions, but this app still looks nicer and functions better for this purpose than any of the other grocery list or regular list apps I tried. I agonized over what to do, since this really affects my workflow. I finally created a new account on Out of Milk and started fresh. When I started out I had no categories, so I added my own and so far so good. It seems that the developers released an update before they really should have, but that the category issues have finally been fixed. 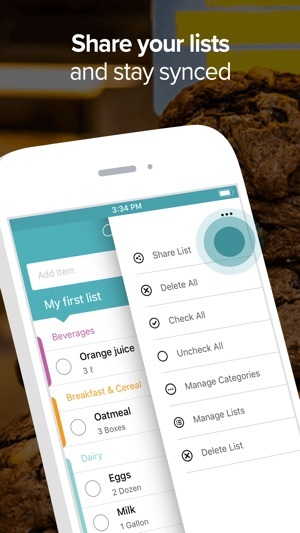 I like having a separate app just for groceries, because I need different functions than on my regular to-do list. 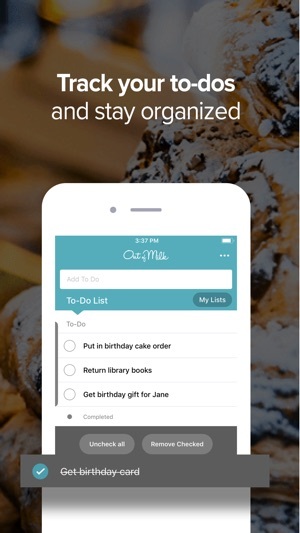 The only wish I have is that the to-do list section, which I'm not even using, be turned into some type of menu planning tool, which I would absolutely use. 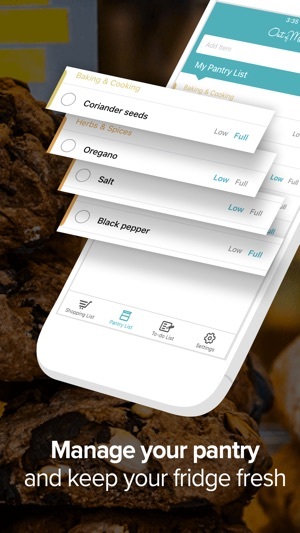 I tried another app that lets you store recipes and make menu plans, but it was cumbersome and ugly. I really don't need to store recipes because it would take too long to constantly add new ones (I like to try new things, so I'm not an "every Tuesday we have tacos" kind of cook). However, it would be nice to have a basic calendar where I could just list what I plan to cook each day. ...but recent upgrades have made it less user friendly. The problems I have seen are with sorting categories and editing items. I shop at the same grocery store every week. I walk through the store the exact same way every trip. When I create a list for that store, I should be able to pre-set the order of the categories on that list. However, no matter how many times I sort the categories on my list...every week they go back to being ordered a different way! The app forces me to re-sort my grocery list every week, which is ridiculous, because it won’t save my changes to the Manage Categories list. Second- I have to add prices to my items EVERY WEEK. For example, I buy Cheerios every week. But every week when I make my list, the edited item from the previous week (where I’ve entered the price) is sorted to Uncategorized. So I have to select the correctly categorized version of the item and re-enter the price EVERY WEEK. Or, I have to choose the correctly priced version of the item, and re-categorize it to Breakfast EVERY WEEK! Out of Milk is intended to make shopping easier and more organized, and it used to do that! But recently, it has more than doubled the time it takes to make a list, and increased the amount of time I have to spend in the store every week. 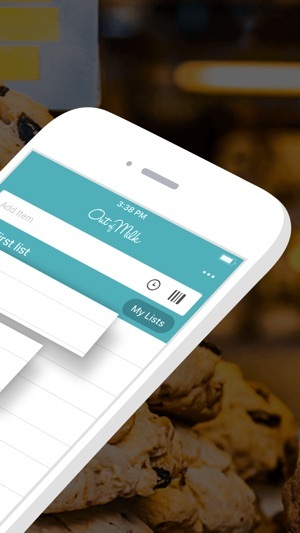 Please, PLEASE, fix these issues because I love Out of Milk and I don’t want to use a different list app! Hey There, I am very sorry you are experiencing issues with the custom categories feature. This is actually a known bug that is currently on our roadmap for development. While I cannot say exactly when it will be fixed, I promise you we know about it & are working really hard to address it. If you have any further questions, or would like to discuss this further, please reach out to us at support@outofmilk.com. Thank you! Used to Love the App, Hate the updates! I have used Out of Milk for several years as my grocery shopping list. I have tried several others but always kept coming back to this one, that is until the latest update. My needs are relatively simple so I am sure that I don't use nearly all of the potential of this app. Unfortunately the latest update not only changed the UI to something truly awful but it (once again!) messed with my categories that I had so painstakingly setup. It seems like every time there is an update this happens. Why??? I wish that I had not updated and could go back to the old version. I would have rated the app 5 stars previously but these awful updates are getting tiresome. Please just leave well enough alone!!!!! As other have mentioned, when I spend hours painstakingly creating categories exactly the way I like them and arranging them according to my store layout, PLEASE DON'T MESS WITH IT!!!!! And another thing, please include an indicator so that I can differentiate between default and custom categories with the same name. I want to delete ALL of the default categories and create my own. And please don't create new default categories like the current version seems to like to do repeatedly. This is getting tiresome. LEAVE MY APP ALONE, PLEASE!!!! !